Your employees expect reliable server services – from trouble-free log in, data storage, email and calendar to internet access and printing. You need a stable, scalable server operating system for this, to easily and comfortably manage servers and users with as much automation as possible and quickly integrate new functions, regardless of whether these are operating in your local computer center or in the cloud. UCS brings together all the functions that are important for operating and managing professional IT environments, focusing on a central administration concept. Important functions for operating professional IT environments are already integrated, such as network and mail servers and services for authentication, backup, network installation and software distribution. Additional functions and third-party applications can be easily installed later using the integrated app center. With standardized interfaces, ready-to-use connectors and complete Open Source licensing, UCS fits into existing – even complex – IT environments and can be easily and flexibly expanded. 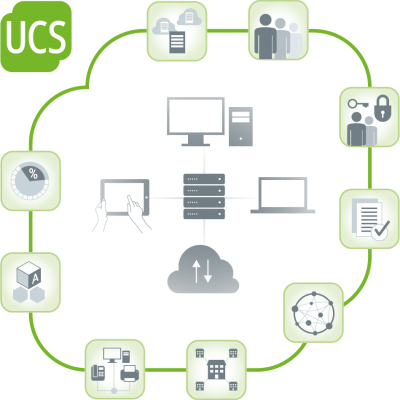 With its extensive Active Directory-compatible domain management, UCS is a fully-fledged alternative to Microsoft server solutions, yet with additional features. Univention Corporate Server’s central web-based management system minimizes server operation complexity and effort. This allows you to easily manage all the systems within a UCS domain, regardless of whether they are spread over one or several sites. New servers and clients can be integrated with just a few clicks and provided with the necessary roles and services. Even systems from other manufacturers, e.g. Microsoft, can be easily integrated.